Whether this was just plain stupidity, or the driver was sleep-deprived, or the driver honestly didn't know what to do when his vehicle broke down in the middle lane of a motorway, either way, he landed himself in hospital. 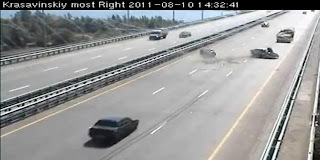 While travelling on the Krasavinsky bridge, over the Kama River, Russia, this motorist suffered an engine failure, resulting in him and his passenger being isolated in the middle lane with traffic passing at speed on both sides. Rather than moving the car to the side of the road, the driver pops open the hood to assess the situation. Completely unaware of a motorist, a car plunges at high-speed into the stalled car. The driver of the stalled car sits up but doesn't move his legs with his passenger slowly emerging from the car, while the second driver shows inactivity.